When he has a goal in mind, there’s little that can stand in the way of Dr. Steve Allen. Allen, 62, is CEO of Nationwide Children’s Hospital and a New Albany resident. And for the vast majority of those 62 years, he’s had the practice of medicine – and helping people in need – in mind. On any given day, Allen might be involved in strategic planning, recruitment, government relations, fundraising, evaluations or visiting one of the hospital’s 47 other facilities throughout Ohio. Allen grew up in Abilene, Texas, and got his first hospital job at age 19. He earned his medical degree at the University of Texas Medical Branch. He worked for the University of Texas Medical School at Houston for 24 years prior to getting the Nationwide Children’s job, which he has held for eight years. He was also at the Children’s Memorial Hermann Hospital in Texas for the last 12 of those years, serving as vice president and CEO at the time he left. Throughout his career, Allen has been guided by an unending desire to learn more and a compulsion to help those with life-threatening problems. The desire to alleviate the burden of illness – at both the patient level and the organizational level – still guides him. Among the many aspects of the work he enjoys is the opportunity to watch young professionals blossom into great scientists, clinicians and other leaders. The University of Texas gig was at a teaching hospital, and he has lots of chances to see Nationwide Children’s newcomers develop their skills as well. Allen wasn’t intending to leave the University of Texas job when he was contacted by a recruiter about the one at Nationwide Children’s, he says; he enjoyed everything he was doing there, too. And his first experience with central Ohio could have been better. When he got off the plane from sunny Texas in January 2006, it was 20 degrees outside, with 40 mph winds and snow falling. But he was impressed by the rigor of the search committee as well as by the ambitions and aspirations of the hospital and the central Ohio community. “I felt that opportunities like this don’t come along very often and this was worth taking a chance on,” Allen says. s to Nationwide Children’s to take advantage of the hospital’s heart, gastrointestinal and cancer programs, among others, Allen says. The hospital’s research institute and its work to rejuvenate the neighborhood it’s in are some other highlights for Allen. He’s also impressed by the accomplishments of such endeavors as its vaccines initiative, tissue bank and gene therapy program. “We have, far and away, the most comprehensive gene therapy of any children’s hospital,” says Allen. For him, though, the biggest highlight is the people, from housekeepers to first-class scientists, who keep Nationwide Children’s improving. “I believe the hospital is becoming the institution the community has always aspired for it to be,” he says. Allen’s office may be about 15 miles southwest of New Albany, but the city where he lives is always on his mind, and the city and hospital have a variety of connections. One big connection is to the forthcoming Philip Heit Center for Healthy New Albany. The hospital will operate a space of about 8,500 square feet, with services including orthopedics, sports medicine, sports and orthopedic physical therapy, radiology and lab services. Nationwide Children’s also provides sports training and sports medicine support for New Albany-Plain Local Schools. New Albany is a good community of residence for someone deeply involved in the world of health, Allen says. There are always other walkers, runners and cyclists out, and community offerings such as the New Albany Farmers Market only add to the vibe. 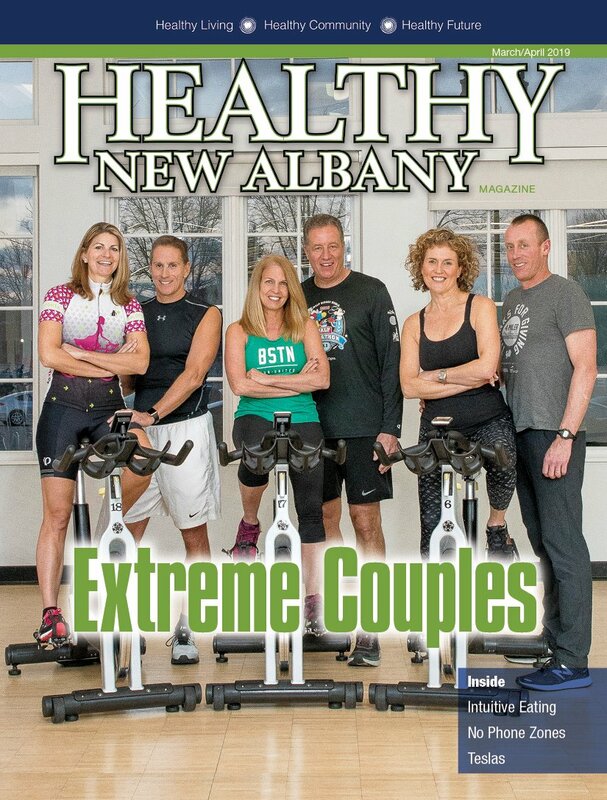 “There’s obviously a very high level of healthy living in New Albany,” he says. Allen was a runner when he was younger, though he spends more time biking than running nowadays. On the running front, he has participated in the Nationwide Children’s Hospital Columbus Marathon the past three years, and on the biking front, he has participated in every Pelotonia except one, when he was out of town visiting family. He’s also an avid golfer and skier. He makes an effort to eat right, too. The hospital’s culture of encouraging healthful options helps there, as does the Subway located on the premises. But he also gets a good deal of encouragement from his family. Wife Jamie is a physician and an assistant professor of anesthesiology at The Ohio State University Wexner Center, as well as a member of the Healthy New Albany Program and Advisory Committee. She is keenly interested in nutrition and keeps the menu around the house healthful, with plenty of fruits and vegetables, fish, chicken, and whole grain pastas and breads. The couple have five children. Two of them are grown: Grace, 34, and Daniel, 32. Three are still at home: David, 20, a student at Denison University; Jakob, 17, a senior at New Albany High School; and Joshua, 15, a freshman at NAHS. Health is a guiding principle for all of the Allen children; Joshua runs cross-country at the high school, Jakob has taken a major interest in healthful eating and David – who has written several stories for Healthy New Albany Magazine, including one in this issue – is studying biology at Denison, with the intention of going to medical school. Garth Bishop is managing editor. Feedback welcome at tdufresne@cityscenemediagroup.com.